You can redownload and reinstall any previously purchased apps that have since been deleted from an iOS device, even if you deleted them a long time ago or never even installed them in the first place. As long as the iPhone, iPad, or iPod touch is using the same Apple ID where the original app was bought and downloaded with, the re-download process is quick and simple. And for clarification, yes, re-downloading an app will re-install that app into iOS. You can use this to reinstall apps you have deleted, or with apps that are assigned to an Apple ID but have not yet been installed onto a particular iOS device using the same Apple ID. That means you can download an app to your iPhone that you previously downloaded or bought onto a different iPhone or iPad, as long as it remains compatible. This works the same on all versions of iOS to reinstall an app, though the exact steps are slightly different on iOS releases and the versions of the App Store, and the appearance can be slightly different too. That’s all there is to it. 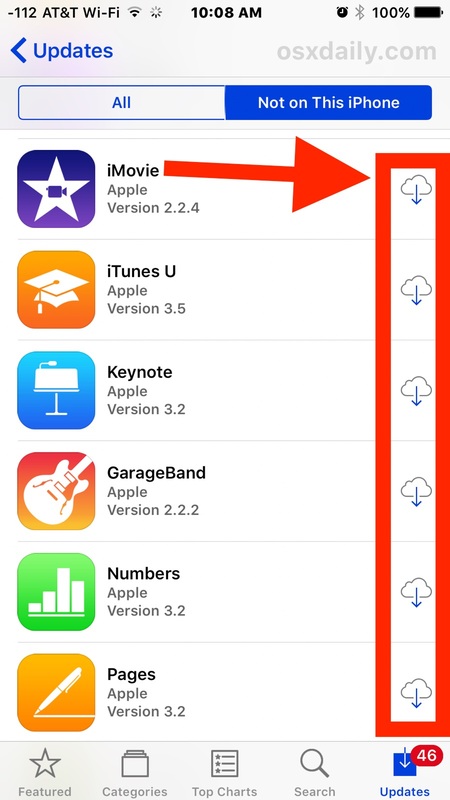 As long as the app(s) were once downloaded or purchased using the same Apple ID, you can easily access and redownload any app this way. The only exception to this is when an app has been removed from the App Store completely either pulled by the developer or by Apple, but that is quite rare. Keep in mind that newer versions of iOS look different from older releases of system software, but the functionality remains the same. This is what you’d do if you want to reinstall an app you deleted to quickly free up some space on an iPhone, iPad, or iPod that has run out of storage capacity. Likewise, this is the same procedure to restore an app that was accidentally deleted. Another side to this is you can download and install apps you bought or owned on a different iOS device onto a new different one. All of this is possible thanks to the generous App Store policy that lets you buy an app once and then have free recurring downloads available for free, as long as it’s on an authorized device using the same Apple ID. It sounds windowsish but I swear if an app is crashing and you delete and reinstall it like this it will fix it sometimes. Try it out. Your instructions did not work for recovering an accidental deletion of an app. The purchased list did have it but the reinstall cloud was not an option nor was the app under the not on this phone. Do I now need to log onto my computer and try from there? I tried to recover it, however the app does not show up in the not on this iPad section. What are my options? I accidentally deleted an app from my Iphone. I followed the instructions and an able to open and use the app but only from within the app store. How can I get it to show up on my home page again? I’m stumped. I have deleted a free app called Raptors Online accidentally, then to free up storage space, but since then I have been unable to re-download it. the little cloud symbol is no longer there, nor the “free” symbol either. I’m stumped thinking what to do, and I’ve already tried downloading it to my computer, with no results, and I’ve also looked at several articles, also with little success. Any suggestions? Sometimes apps get pulled from The Store and aren’t simply available anymore. 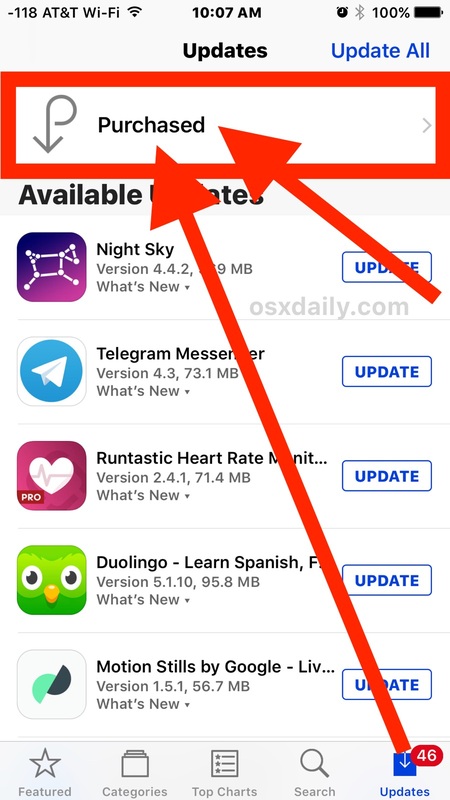 Or you have updated iOS to a newer version and the app in question isn’t compatible, hence why you don’t see it as an available download. That, or something went pear-shaped. My newly updated iOS 11.1 does not display a selection for “Purchased”. I have to go to “Account” (using my photo link) and then get a the list of purchased Apps.Is this the procedure to be used for restoring Apps on a new iPhone?